I know many people have asked the question, “Why is the Pro Football Hall of Fame in Canton, Ohio? What’s up with that?” Compared to all of the huge football cities across the United States, why is the Pro Football Hall of Fame game held in Canton? Well, thanks to my recent visit to the Pro Football Hall of Fame, I can tell you why! September 17, 1920, the American Professional Football Association was formed in Canton, OH. It was later renamed the National Football League. The Canton Bulldogs were one of the first teams and they were two-time champions in 1922 and 1923. Jim Thorpe, who is one of the first great football players, played with the Canton Bulldogs. 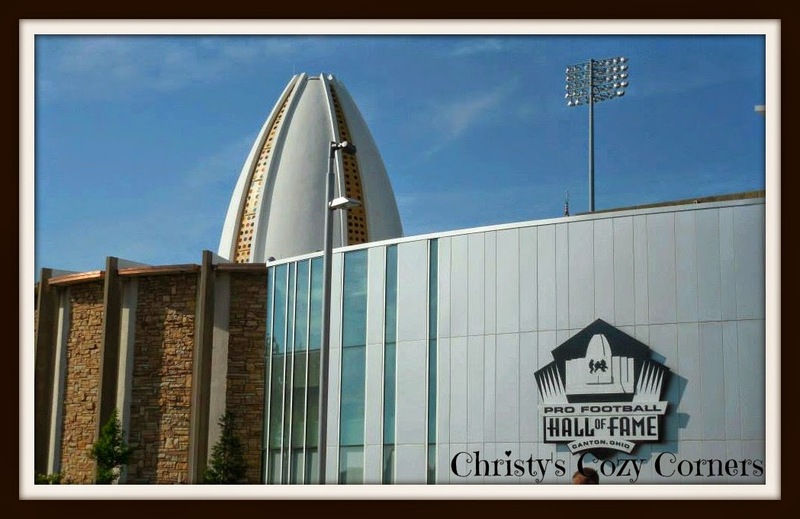 September 7, 1963 the Pro Football Hall of Fame opened in Canton, OH after a lot of planning by the citizens of the city. 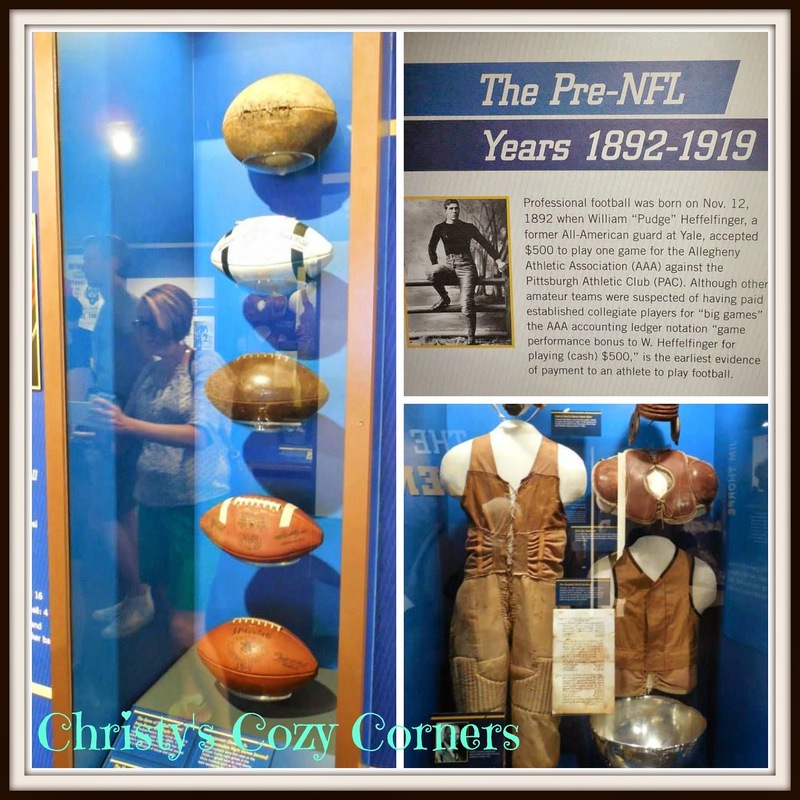 As you can see by the above pictures, the Pro Football Hall of Fame takes you on a tour through football history beginning with the pre-NFL years of football. It was very cool to see how football has changed over the years. Check out the early football “gear.” Those pads and helmets could not have provided much protection. Compared to today’s hugely technical equipment, these seem extremely primitive. The Pro Football Hall of Fame has so many interesting displays with early football information. Being from Massillon, OH, this Pro Football Hall of Fame display was really cool to see. The bust of Paul Brown was in the bust room, but the Massillon vs. Canton game display was in with the history of football. Paul Brown has got to be one of the best football coaches ever. And the Massillon Tiger stadium is named after him. In 1967, Paul Brown was inducted into the Pro Football Hall of Fame. Paul Brown built a football dynasty in Cleveland in the 1950s as the football coach. The Cleveland Browns were the team to beat in those days. Now, unfortunately for us Cleveland fans, they seem to be the team that gets beat…. At least at the Pro Football Hall of Fame, all of the Cleveland Browns fans can revel in the fact that they used to have a winning team. In 1950, 1954, and 1955 the Cleveland Browns were the champions. Unfortunately it was back before the Super Bowl days, and the Cleveland Browns don’t have a Super Bowl ring, title, trophy, or bragging rights. Who knows? Maybe we can hang our hopes on Johnny Manziel. What do you think? But even though the Browns don’t have a Super Bowl title, there are 21 former Browns players in the Pro Football Hall of Fame. Speaking of the Super Bowl, here is this year’s Lombardi trophy which spends part of its journey at the Pro Football Hall of Fame each year. The Lombardi Trophy is named for the legendary football coach Vince Lombardi. It is made of sterling silver and depicts a football in kicking position. 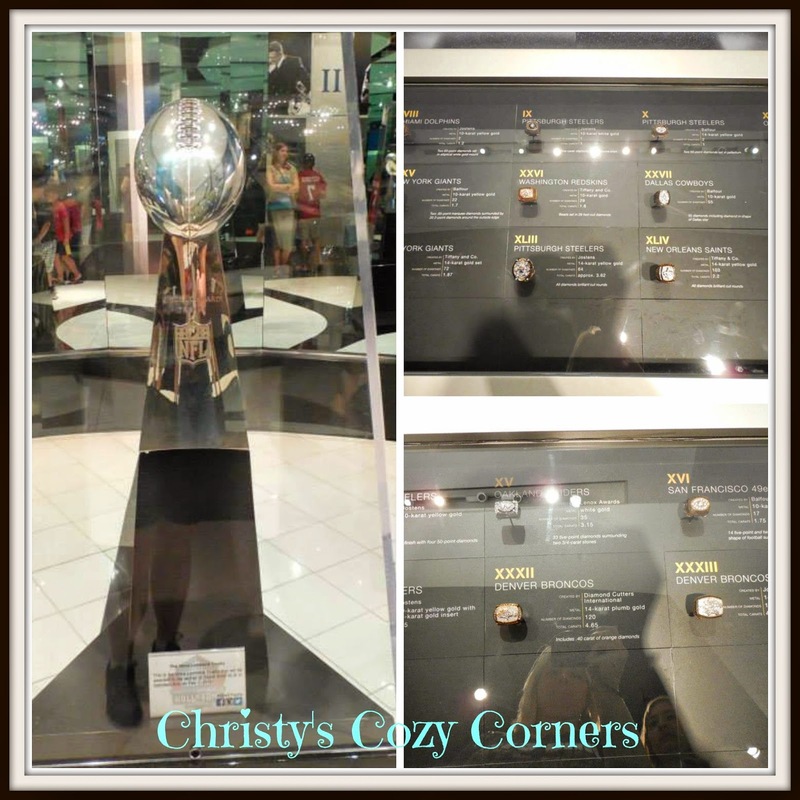 Not only is the Lombardi Trophy displayed at the Pro Football Hall of Fame, but the Super Bowl rings from each year are also displayed. Being the girls we are, my daughter and I couldn’t get over how shiny the trophy and the rings are! My son is more of a baseball guy, but there were still things he enjoyed at the Pro Football Hall of Fame. Kyle is a tall guy. He is 6’5 1/2″ at 16 years old. But compared to Richard Sligh who was 7′ tall and 300 lbs., even Kyle looks small. 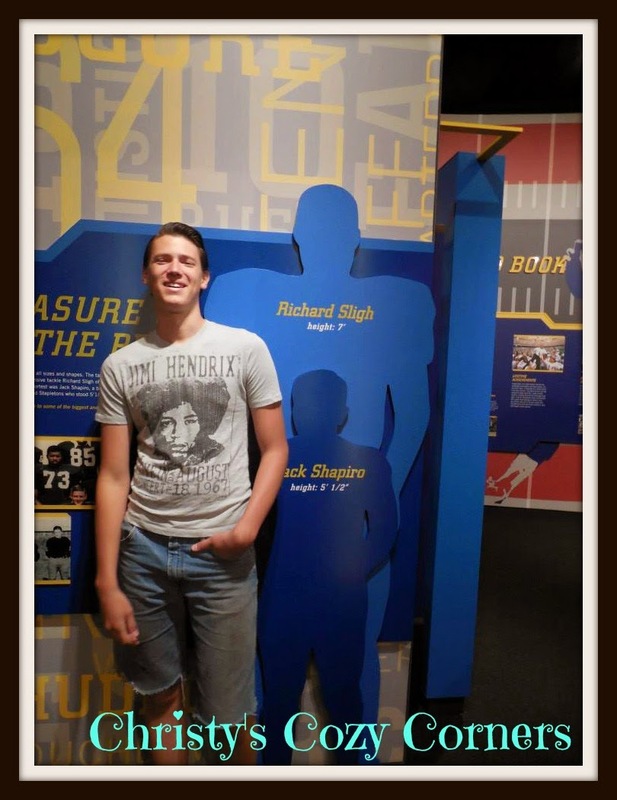 There are several interactive exhibits around the Pro Football Hall of Fame that make it easy for you to compare your size to football players. You can compare your leg size, hand size, and bicep size with the big guys. Lots and lots of football jerseys are on display at the Pro Football Hall of Fame. 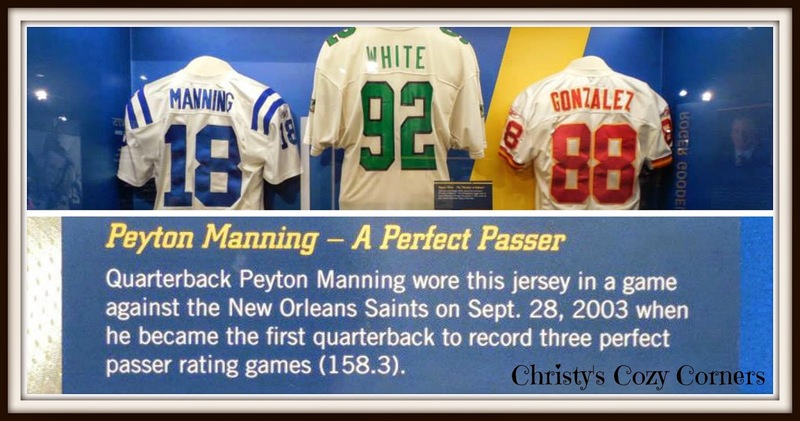 No matter what your favorite football team is, you will probably find a player’s jersey from your team at the Pro Football Hall of Fame. Back when I was a little girl, most families only had one television at home. And since my dad loved sports, we three girls and my mom would watch with him. My dad loved the Browns and the Dallas Cowboys. Tom Landry was an amazing man and coach. Roger Staubach was the quarterback. And then in 1980 the Browns seemed to have new life with Sam Rutigliano’s “Super Bowl” team. I had the record with the song. Brian Sipe a-passin, Newsome a-catchin….those were the days to be a Browns fan. Who else remembers that interception that ended our Super Bowl dreams? Then came Bernie Kosar and our hopes were once again high for a Super Bowl. Then came the Denver Broncos and John Elway to ruin our hopes and dreams. My late husband loved the Broncos for that very reason. He loved that the Browns got beat by the Broncos all the time. Traitor! We were fortunate enough to be visiting on a Hall of Famer Friday. The speaker that day was former Cincinnati Bengal football player, Anthony Munoz, who was inducted into the Pro Football Hall of Fame in 1998. He is such a great role model, and it was very interesting listening to him speak. I would highly recommend checking out the Anthony Munoz Foundation to learn about all they do to help today’s youth get into college. The Pro Football Hall of Fame Inductees from the Class of 2014 included these seven former NFL players. Michael Strahan, former New York Giants defensive end, played in 7 Pro Bowls and holds two NFL sack titles. Aeneas Williams, former Phoenix/Arizona Cardinals and St. Louis Rams cornerback/safety, was named to the Pro Bowl 7 times and had 55 interceptions for 807 yards and 9 touchdowns. Andre Reed, former Buffalo Bills and Washington Redskins wide-receiver, had 941 receptions which is 266 more than the #2 on that list. He was elected to 7 Pro Bowls. Walter Jones, former Seattle Seahawks tackle, was All Pro 6 times and was named to the NFL’s All Decade Team of the 2000’s. Derrick Brooks, former Tampa Bay Buccaneers linebacker, never missed a game during his career, and he was elected to 11 Pro Bowls. Ray Guy, former Oakland/Los Angeles Raiders punter, is the first punter to ever be selected in the first round draft. He played in 7 Pro Bowls, 7 AFC championship games and 3 Super Bowls. He only had 3 out of his 1,049 punts blocked in his career. If you are traveling to the area for the Hall of Fame game this August, you can find maps, restaurant recommendations, hotel information and other entertainment suggestions on the HOF website. 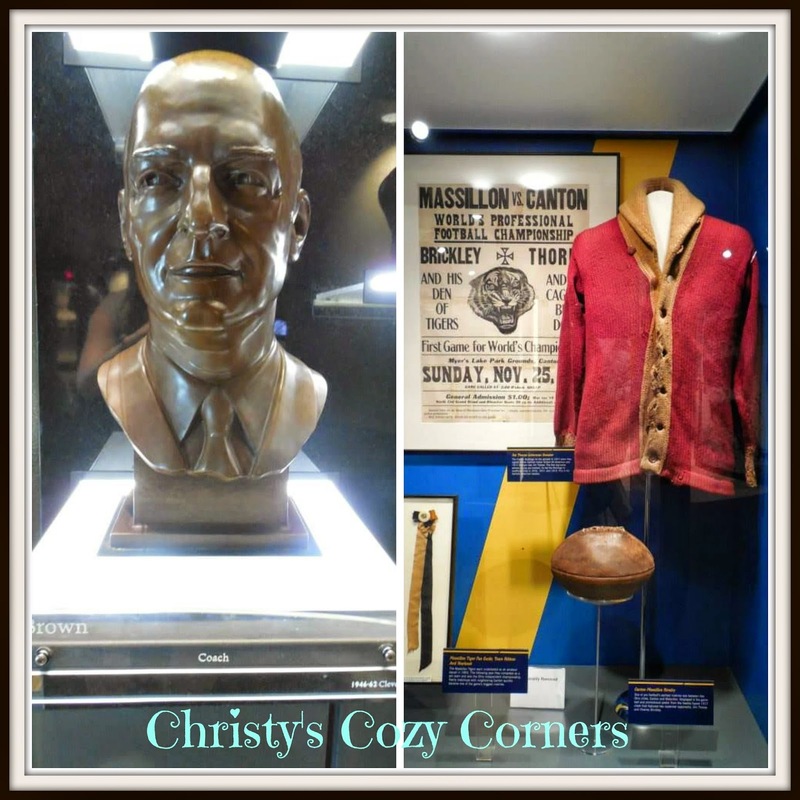 Your trip to Canton, OH won’t be complete without a visit to the Pro Football Hall of Fame! Want to know what kids have to say about the Pro Football Hall of Fame? 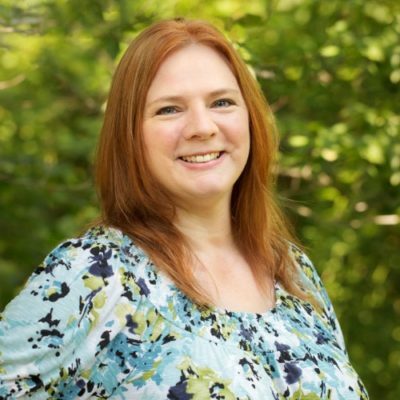 Check out the review my daughter did for Family Travels on a Budget.